Lyall F. Harris: "Subject matter informs and determines the structure of these works, which use or reference the book form in order to explore various content." Charlottesville, Virginia: Lyall F. Harris, 2018. Edition of 50. 8 x 6" closed; 30 panels with self wrapper. Accordion structure. Signed and numbered by the artist. In lightweight slip case. Lyall Harris: "Close-ups are paired in a series of photographs by the artist to illustrate similarities between objects from the natural world and her young children." 11.25 x 6.5" closed, opens to 11.25 x 24". Letterpress printed on handmade papers from Dieu Donné. Stiff cover with title, tipped-in pages. Signed and numbered by the artist. Artist Statement: "What happened, reader, where you are? What happens there today? asks the artists' book Site. Inspired by her discovery of a slave auction block on the first morning in her new town of Charlottesville, VA, Lyall Harris grapples with US history in a project where content is revealed and supported through its material components. 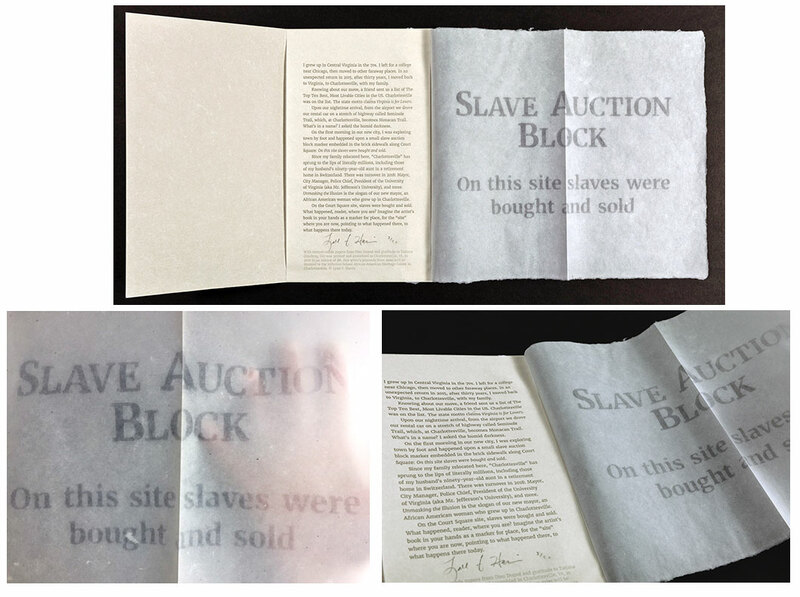 With assistance from papermaker Dieu Donné, Harris created a watermark broadside, the key component of an artists' book that both points to the past and brings the reader into an awareness of present." Any artist's proceeds from sales will be donated to the Jefferson School African American Heritage Center in Charlottesville. Florence, Italy: Lyall F. Harris, 2017. Edition of 150. 8.5 x 8.75"; 144 pages. Printed digitally. Perfect bound. Paper-covered boards. 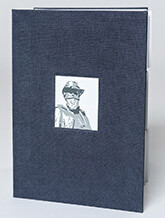 In illustrated paper slipcase. Signed and numbered by both artists. 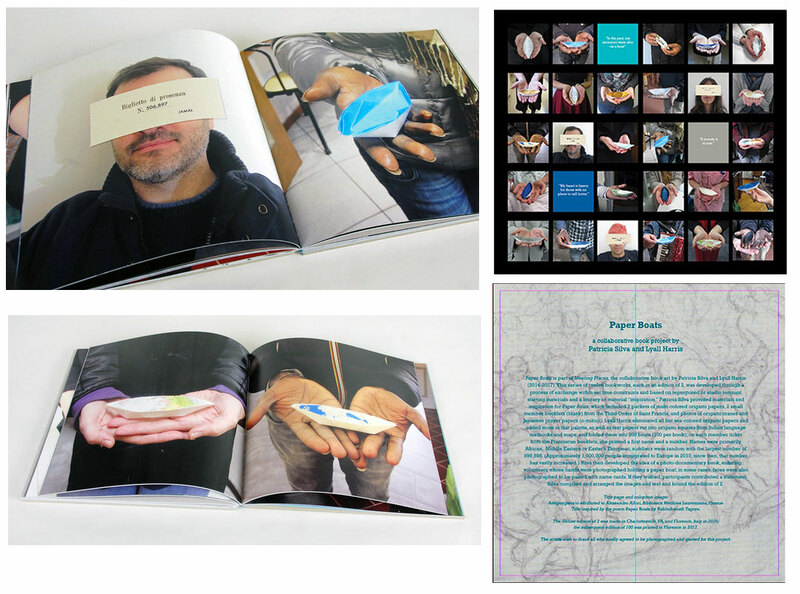 Paper Boats is a collaborative book project by Italian artist Patricia Silva and American artist Lyall Harris. 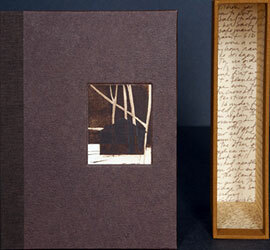 Originally it was produced in an edition of 2 as part of their book art project "Meeting Places." 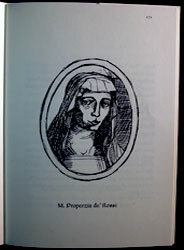 This is the digital version in an edition of 150. Artist statement: "A photo-documentary illustrates the distressing loss of identity taking place in contemporary mass immigration to Europe. The visual rhythm of the book works something like a meditation (vs. a political statement) – there are 100 images of hands with boats, interspersed with about 25 quotes (some in Italian) and 10 'portraits,' total page count is 144 – and we think it brings this content home in a striking way." Lyall Harris: "In creative collaboration, what makes the co-created work seamless? How do combined efforts transform a creative project into something more than just the sum of its parts? 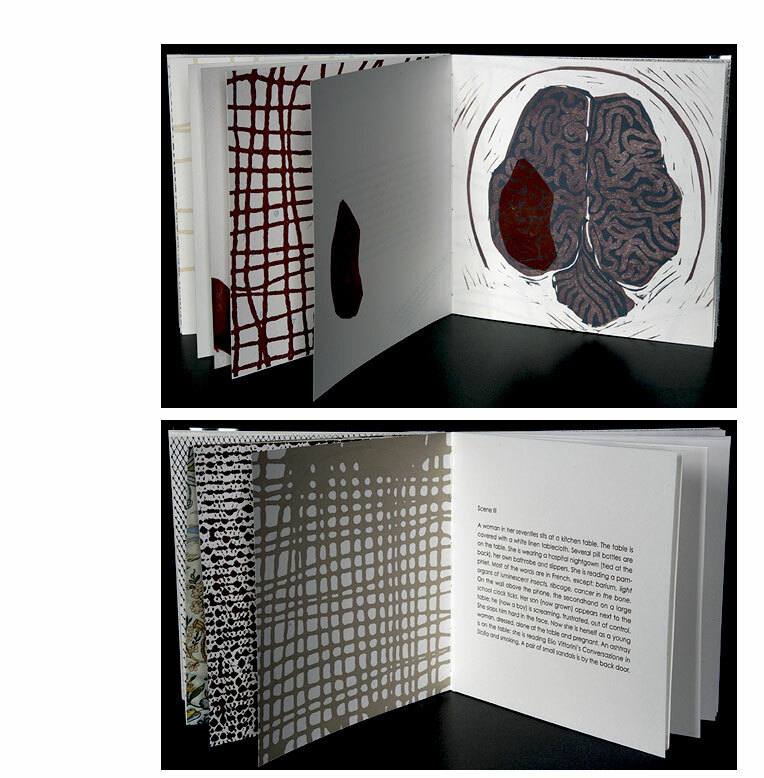 Since 2014, Lyall Harris and Patricia Silva have produced a series of twelve collaborative bookworks. "We set constraints for the process, both of materials and time, which forced us to work in an immediate, intuitive, and exploratory way. Our process began with one artist providing the inspiration and starting materials. The receiving artist then had only weeks to bring the project to a 'halfway' point, adding or editing materials sparingly during this phase. 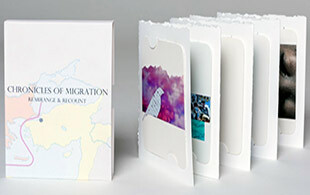 The project was then given back to the originating artist who finished the books (in an edition of 2). The varied work addresses issues and histories from our shared and layered perspectives as artists, mothers, daughters, wives, and expats in a changing and complex environment. "Paper Boats began with a stack of origami papers, attendance booklets from the Third Order of Saint Francis, and images of paper cranes and Japanese prayer papers (o-mikuji). 100 boats were folded using papers with a 'sea' palette as well as upcycled Italian language books and maps. African, Middle Eastern, and Eastern European first names were printed on the attendance tickets along with a random number from 1 to 1,000,000. With the help of volunteer participants (faces, hands, statements), the project then became a photo-documentary about both our common humanity and the distressing loss of identity taking place in contemporary mass immigration to Europe." Corbignano, Italy: Lyall F. Harris, 2013. Open Edition. 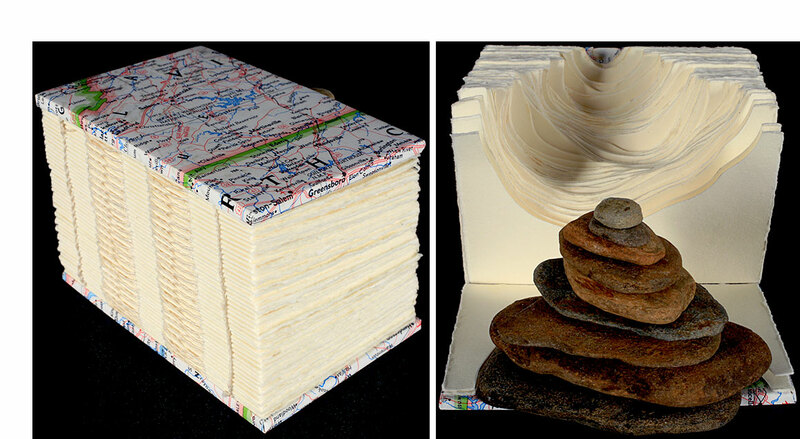 7.25 x 5.125" Two books, 7 x 3" closed, are each made from one sheet of paper (size A4, approximately the US standard 8.5 x 11 in. ), 150 gram Daler Rowney Canford Paper, side panels are glued so that middle section only is 3-d, structures are housed together with a band. Slipped into gold envelope. Florence by Day: "Brunelleschi's dome has been standing for 577 years." 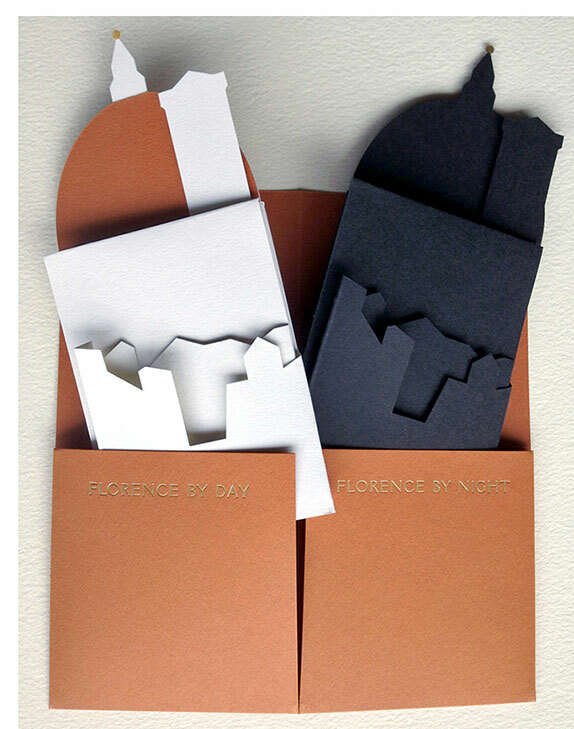 Florence by Night: "Open edition by Lyall Harris, Florence 2013." Lyall Harris: "To say that Florence's Duomo is iconic is an understatement. Breathtaking and unbelievable, the dome, completed in 1436 per Brunelleschi's ingenious design, dominates every image of this city." Corbignano, Italy: Lyall F. Harris, 2013. Edition of 20. 6.125 x 11.75"; 12 pages. Ink washes and inkjet printing on 200 gram Fabriano Accademia Drawing Paper. 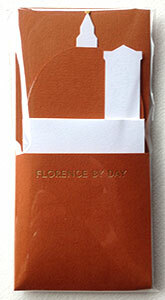 Japanese stab binding with covers of 360 gram Fabriano Murillo Artist's Paper. Window opening on front cover to display title from title page. Signed and numbered by the artist. Lyall Harris: "This poem is indebted to Maxine Kumin's poem, The Envelope, which I have read and reread over the years since having children." New Hampshire resident and Pulitzer Prize winner (for Up Country, 1972) Kumin has served as Consultant in Poetry to the Library of Congress and as Poet Laureate of New Hampshire and is a former Chancellor of the Academy of American Poets. San Francisco: Lyall F. Harris , 2011 . One-of-a-Kind. 6.25 x 9.5"; 12 pages. Techniques: erasure, digital print, photo, writing, rubbing, sewing, embossing, copier, paper engineering. Objects: hair, tooth, nail clippings, pony tail holder, hair pin. Bound to resemble office folder with sectional tabs. Lyall Harris: "Evidence is a crime scene 'dossier' which uses texture and impression, actual objects, digital and photo documentation, and writing and erasure as vehicles to achieve a visceral and material reading experience. While the exact nature of the crime is never explicitly revealed, the many points of entry leave the viewer/reader with disturbing clues about the location (a bathroom) and the people involved (mother and child or children). The dossier does not only offer documentation of the crime, it literally captures aspects of it. 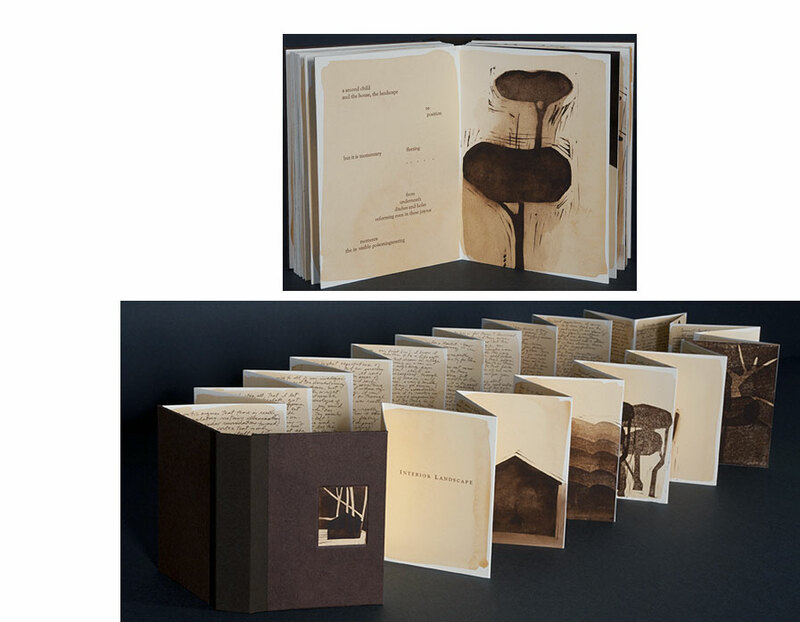 "This one-of-a-kind book was made in response to research on maternal infanticide." The dossier is an impressionistic recreation of a fictitious crime influenced by or (as the movies say) based on real events. San Francisco, California: Lyall F. Harris, 2010. Edition of 10. 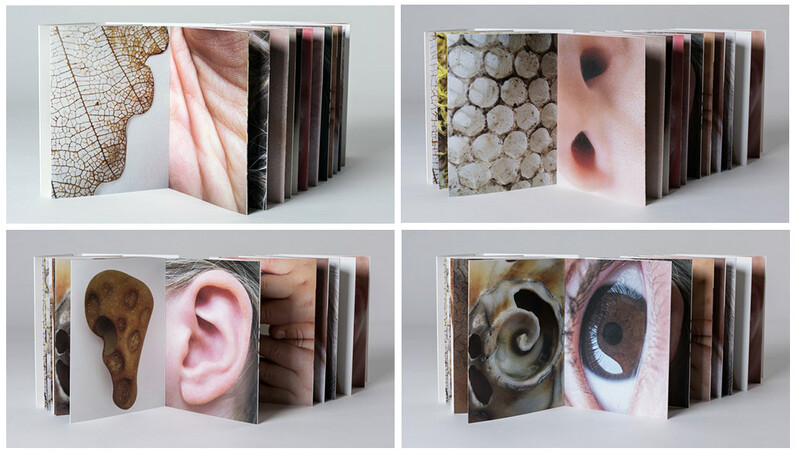 7 x 7"; 40 pages. Letterpress printed text from polymer plates. 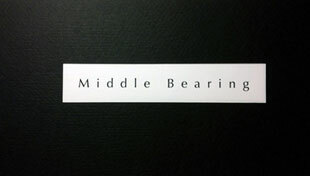 Front cover title printed from metal type. 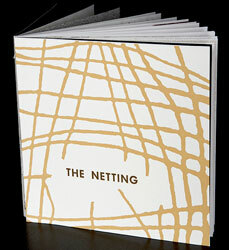 Nets and textures created with an etching press, then scanned and printed from polymer plates. Photos and wallpaper printed digitally. Other images hand printed linoleum cuts. Telephone cord image printed from a polymer plate. Reflective end pages. Handbound with exposed French link stitch. Lyall Harris: "A short, visually adapted play, The Netting develops over the course of seven scenes, accompanied by images and textures, that read like dream sequences. The content is multi-layered and rife with manifestations of anxiety, which ultimately intersect and converge. This book was inspired by the short 1940s films by Maya Deren." Maya Deren (1917-1961) was both an experimental filmmaker and film theorist whose work remains obscure even though in 1986 the American Film Institute created the Maya Deren Award for independent film and video makers. Oakland, California: Lyall F. Harris, 2010. Edition of 10.
original drawings printed from polymer plates. Typefaces are 30 pt Solemnis, 18 pt Goudy Thirty, Centaur, Arrighi, 14 pt Centaur, Arrighi, Gill Sans, Gill Sans Italic, 12 & 10 pt, Gill Sans. Handsewn binding using pamphlet stitch. "Se Ben Fu Donna" (although she was a woman) is a pejorative tag sometimes directed Sappho. 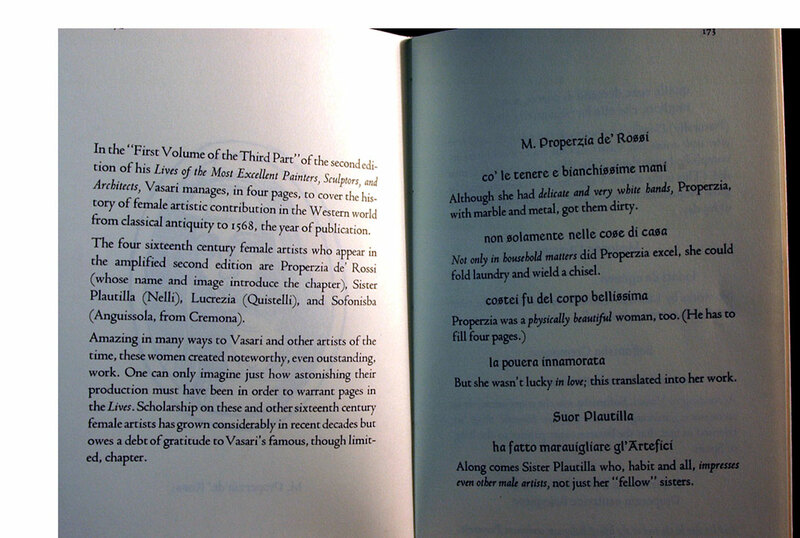 Lyall Harris: "A tongue and cheek interpretation of excerpts from the sole and very minimal chapter about female artists in Vasari's famous biographies, Lives of the Most Excellent Painters, Sculptors, and Architects with blank pages standing in for the absence of women throughout art history." Giorgio Vasari (1511 - 1574) an Italian painter, architect, and writer is best known for his biographies of Italian Renaissance artists. San Francisco, California: Lyall F. Harris, 2001. One-of-a-Kind. 5.25 x 3.75 x 2"; 4 pages. Digital printing. Collage. Assemblage. 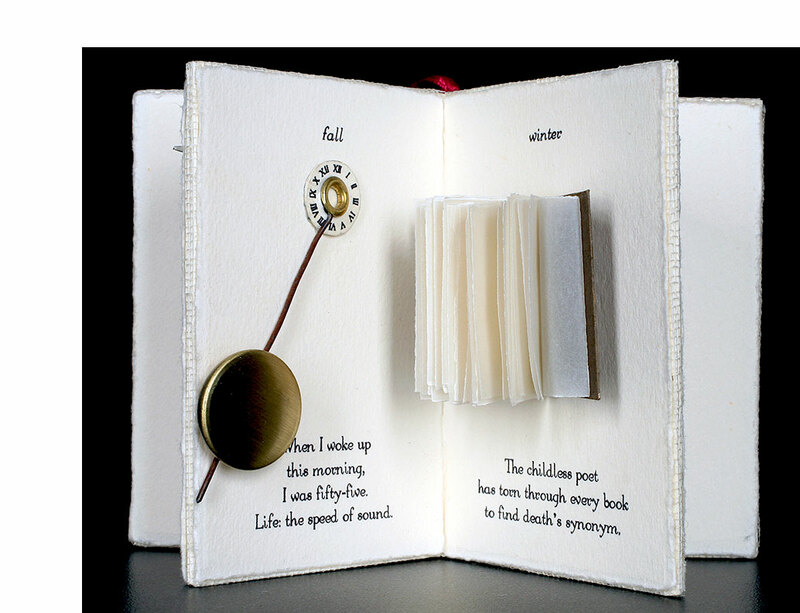 Lyall Harris: "A sculptural book of haiku and visual interpretation that atypically represent the four seasons." San Francisco: Lyall F. Harris, 2008. One-of-a-Kind. Two piece presentation: book and barbed wire. 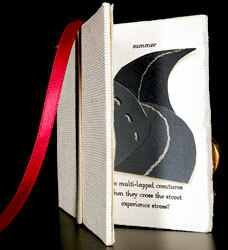 Book: 2.5 x 4" closed; 52 pages; handbound. Barbed wire: 7" circumference; 2 pieces. 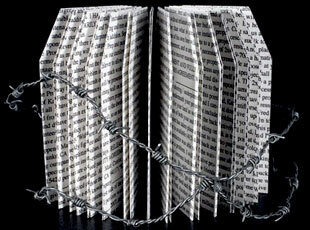 For display book sits in center of barbed wire circles. 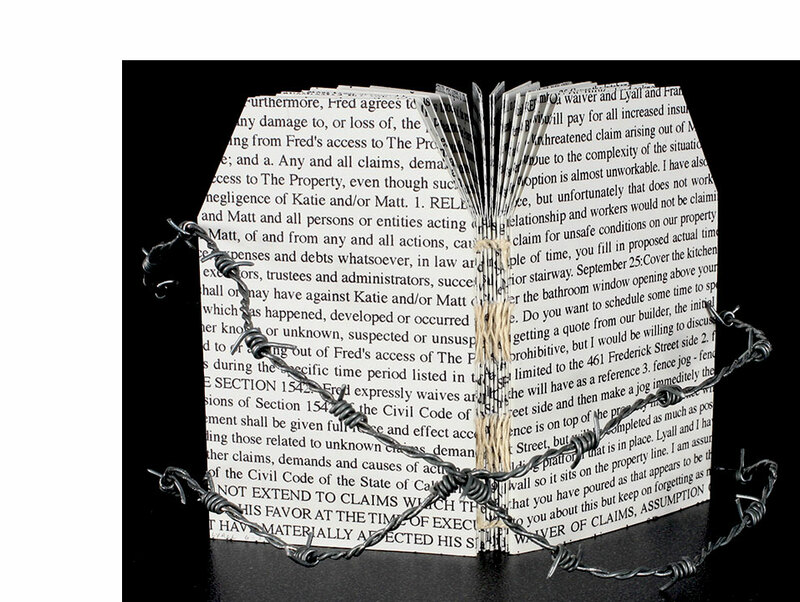 This bookwork symbolizes the artist's experience with a lawyer-neighbor whose only communication came in the form of documents dripping legalese. Lyall Harris: "The title is a line from Robert Frost's Mending Wall. This book came out of the artist's struggle, misunderstanding, and disillusionment with her neighbors during the process of replacing a broken fence." 3.75 x 4 x 2.75"; 90 leaves. 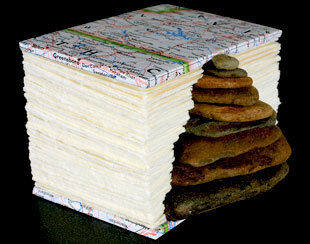 Materials: paper, stones, foam core, thread, glue. Map-covered boards. Lyall Harris: "A couple of summers ago, I was in the mountains in Virginia with my oldest daughter, who was at that time six years old. We were spending the day a mile down an unmarked dirt road at a remote cabin my grandfather built in 1950 in what is now the Blue Ridge Parkway. Like my mother before me, I grew up spending weekends in this rustic cabin (no electricity or heat), including every childhood birthday. For me, the place represented both family retreat and untamed nature, and it was there that I experienced the most freedom of self and of imagination. "I have returned to this cabin over the years, though infrequently because I now live in California. I have never been there without my parents and the time with my daughter was no exception. However, during that particular visit, the wear and tear over the years on the cabin, the diminishing distinctions between manmade (house, fences, dirt road) and surrounding nature, my aging parents, the childhood memories - they all flooded me with overwhelming poignancy. I fully felt the finity quality of my time with my parents and my daughter, the inevitable ruin of the house itself. And yet, collecting the small, flat stones with my daughter, I also sensed the continuum: the four generations of our family that have been there, the persistence of the creek, the history of the landscape and the rocks. "My daughter and I built a miniature cairn with some of the stones; she asked me how long it would last. "Later, when I made this book of a cairn and its wordless contours, I knew it was a marker not only for my daughter and my own past in that hidden valley in the Blue Ridge, but also a landmark gesturing towards the larger continuum." Charlottesville, Virginia: Lyall F. Harris, 2016. Edition of 15. 5.125 x 3.75 x .5"; 16 pages (8 panels). 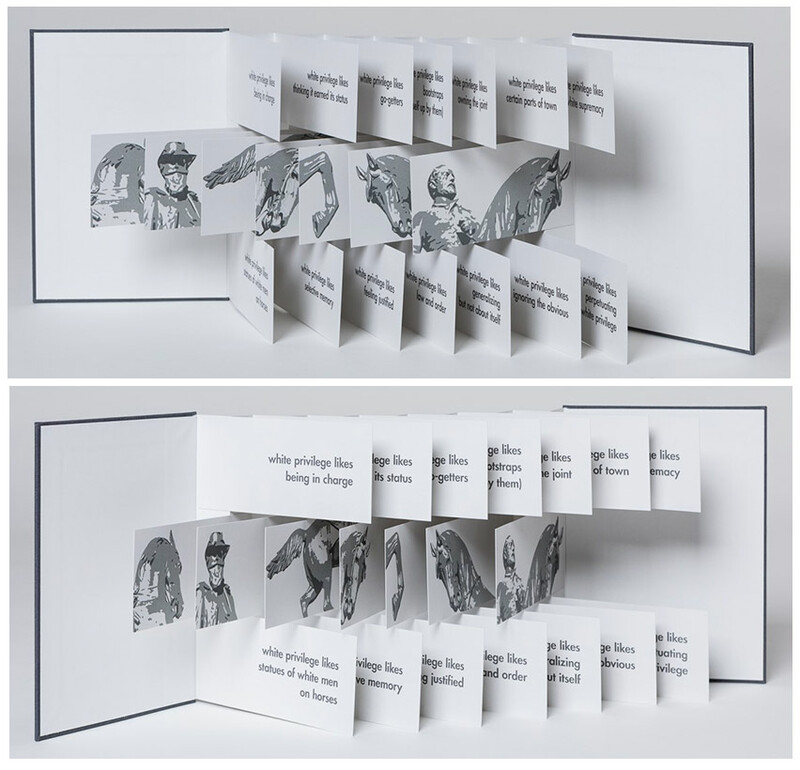 Double-sided accordion structure with removable image cards. Scanned collage images inkjet printed with archival inks on archival paper. Materials: paper, transfer tape. Maps from a 1970 Italian Atlante Storico. 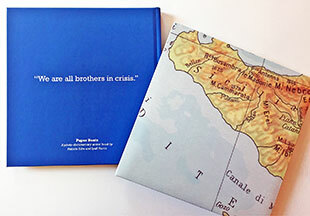 In matching slipcase. Signed and numbered on the slipcase by the artist. "The collaged images are intentionally both specific and broad so that a range of interpretations might be evoked. There is no right or wrong way to 'tell the story.' Rather, the project seeks to stimulate thoughts and ideas about this crucial topic." San Francisco: Lyall F. Harris, 2011. Edition of 3. 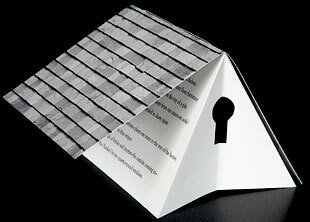 5.75 x 7.25" house-shaped triptych book with three pockets containing three books. 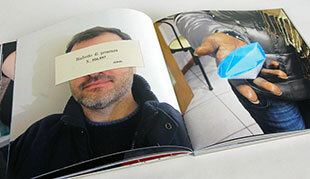 Digitally printed except the corner cover which is a linoleum cut. Handbound including invented structure (attic). Italic text by Gaston Bachelard. Book I. Universe of a House: 4.25 x 5.5" closed, four panel carousel structure. Ribbon tie closure. Book II. Attic: 4.25 x 5.5" closed. Forms sloped triangular roof. Key hole cut opening. Two pages of text. Book III. Corner: 4.25 x 5.5" closed. Four pages of reflective material. Four pages text. Lyall Harris: "First House Physically Inscribed is based on French philosopher Gaston Bachelard's 1958 work, The Poetics of Space. Bachelard's book is an exploration of how our childhood experiences of the architecture and spaces in which we lived not only remain the formative holders of defined associations, thoughts, and memories but how these experiences can be viewed as archetypal, forever shaping our space and place metaphors. "First House Physically Inscribed takes two such 'locations' - corner and attic - from my childhood house and describes memories and events from those places as they relate to Bachelard's ideas. The central section of the triptych presents Bachelard's assertions, principally that: 'The house we were born in [is] engraved within us...'"
San Francisco: Lyall F. Harris, 2011. Edition of 20 + 1 AP. 7.5 x 5.675 x 1.5"; 34 pages. 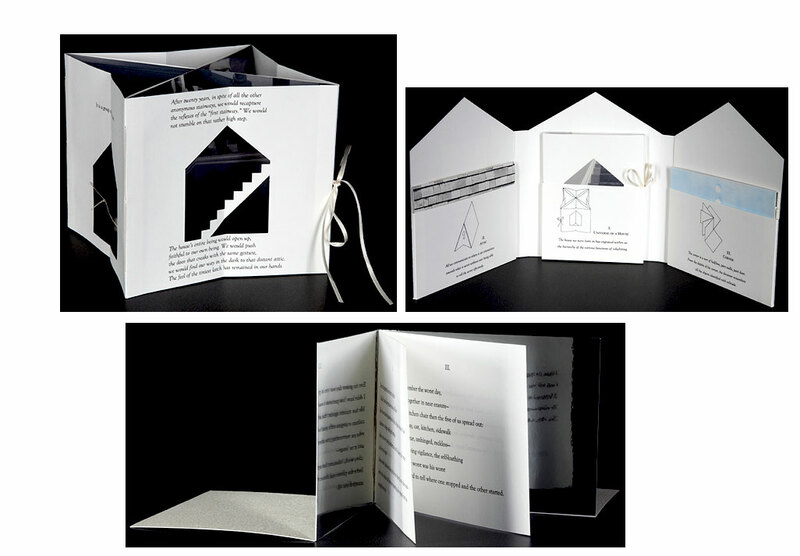 Leporello structure. Techniques: hand coloring (gouache) with linoleum cut printmaking (prints individually made for each book), letterpress printing from photopolymer plates, ink jet printing (journaling). 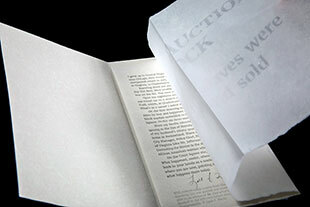 Housed in a cloth covered slipcase with title tipped in. 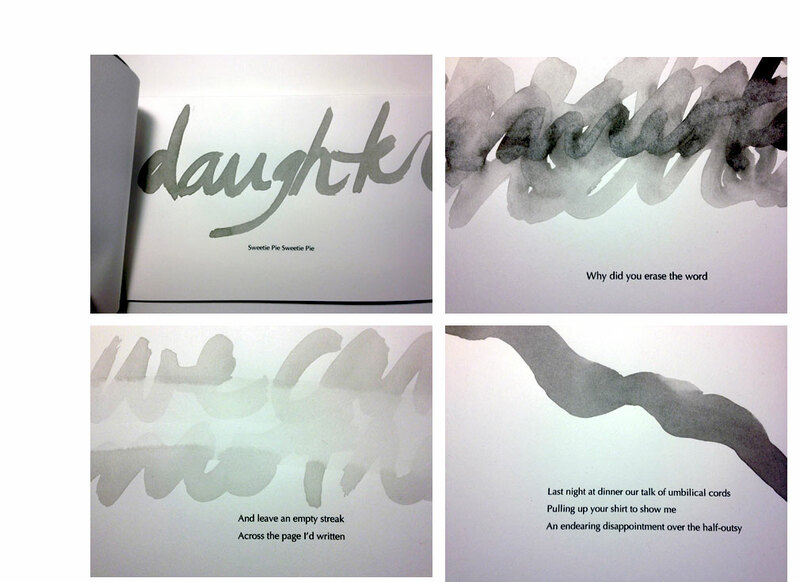 Lyall Harris: "An artist’s book about the challenges of being a mother and an artist. Sylvia Plath’s diary entries on these subjects served as the book’s point of departure. "Plath is directly addressed as 'you' throughout my interpretations of her life as an artist and mother. My own voice hovers closely as Plath and I traverse similar ground in much of the book. This interwoven progression builds right up to Plath’s abandonment of her children through suicide; the text then diverges towards the markedly different denouement of my own story. The 'you' is both Plath and Plath as alter-ego, but it also reaches beyond these, to artist-mothers everywhere, to people who strive to accomplish but who wrestle with myriad infringements on their thinking and doing. In this work, visual depictions become metaphors for the internal battles and attempts against a dissolution of Self while language—even at its 'material' increments of syllable, letter, and comma—functions as an active agent for the project’s overall meaning. "A landscape artist for many years, I have sought to distill and simplify the world around me into images that evoke core, essential qualities. Interior Landscape presented an opportunity to find, within my landscape vocabulary, a metaphor for the substrates of a shifting and complex psychology, with layering and the tension between containment vs. blurred edges as underlying requisites for the pictorial treatment in the book. The representations strive to embody the narrative rather than to merely illustrate it. Occupying a central position in the book, they are located on the recto pages instead of the more typical verso placement. It was paramount that the hand be present in this work, both in the handwriting and in the printmaking, the latter produced from scratch on each recto page for the entire edition of twenty books. "INTERIOR LANDSCAPE began as a response to Sylvia Plath's journal entries on the subject of writing and motherhood but grew to encompass artist-mothers everywhere who strive to accomplish but who wrestle with myriad infringements on their thinking and doing." Charlottesville, Virginia: Lyall F. Harris, 2016. Edition of 20. 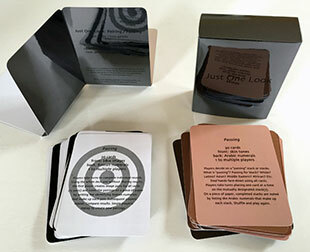 3.5 x 4.5 x 1.5" ; 62 double sided cards. Divided into two card sets of 31. Digitally printed. 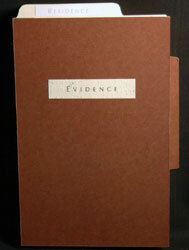 Enclosed in wrap and slip case with title on front. Signed and numbered by the artist. 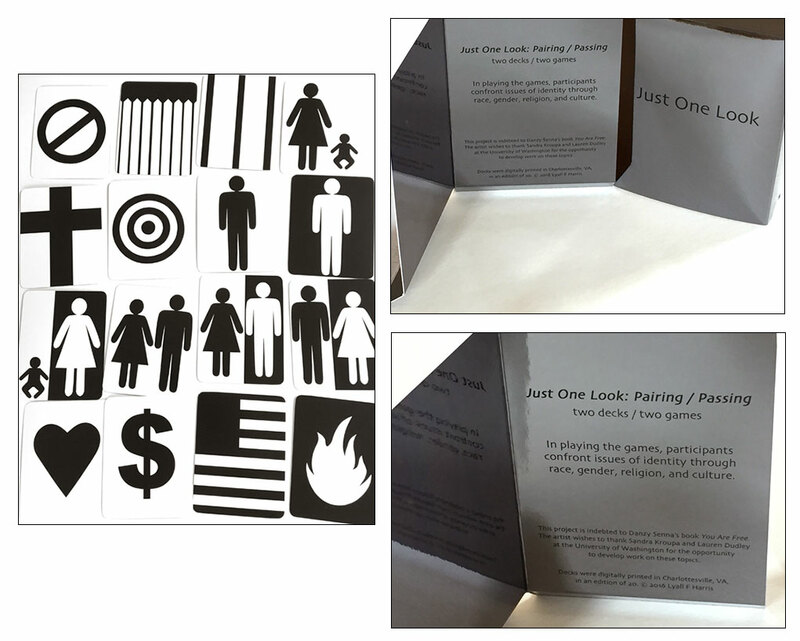 "Just One Look: Pairing / Passing" contains two decks of cards to play two games giving the participants opportunities to confront issues of identity through race, gender, religion, and culture. Pairing instructions: "30 cards. front: b&w images. back: Roman numerals. 1 to multiple players. Players take turns to complete individual rounds. Using the whole deck and without sharing results, the first player creates image pairs for all cards (15 pairs) and notes the pairings on a piece of paper by writing the identifying Roman numerals that make up each pair. Subsequent players: repeat. Compare results. Single players: replay to create new pairings." Passing instructions:"30 cards. front: skin tones. back: Arabic numerals. 1 to multiple players. Players decide on a 'passing' stack or stacks. What is 'passing'? Passing for black? White? Latino? Asian? Middle Eastern? African? Etc. "Deal hands face-down using all cards. Players take turns placing one card at a time on the mutually designated stack(s). On a piece of paper, completed stacks are noted by listing the Arabic numerals that make up each stack. Shuffle and play again." Charlottesville, Virginia: Lyall F. Harris, 2018. Edition of 20. 7 x 5"; 7 panels. Flag structure with 3 flags per page. 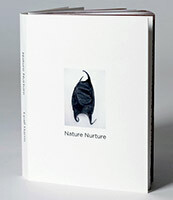 Bound in cloth over bounds with paper illustration on front cover. Signed and numbered by the artist on the reverse side. Lyall Harris: "Statements unfurl in this flag book that seeks to reveal problematic aspects and challenge assumptions of 'white' thinking. Images are photographic details of statues of Civil War generals taken by the artist on Monument Avenue in Richmond, VA. Harris moved to Charlottesville, VA, in 2015, just as the debate over the Civil War statues was erupting. Tensions flared dramatically in August 2017." Dinner Recipes from the Contemporary Working Woman in America by Lyall F. Harris San Francisco, California: Lyall F. Harris, 2011. One-of-a-Kind. 9.5 x 8.5 x 1"; 64 pages. Digital printing. Machine stitching. Variety of fabric swatches. Spiral bound. Lyall Harris: "A book of 'recipes' and swatches of fabric conceptually paired with well known, real life women. Famous and infamous women can be found on alternating pages. With short biographies, the index becomes a critical reference. Women's roles, cultural preconceptions, and stereotypes bubble forth humorously in this book about women via food and fabric."